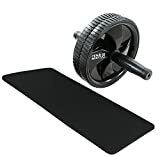 Perfect floor based workout tool for strengthening, toning and building muscle in the shoulders, arms, back and abdominals. Lightweight yet robust black PVC plastic construction – makes it very safe to use and easy to transport so you can use it wherever and whenever you like! Even works the lower ab muscles – well known for being tricky to target. Comes with a knee pad and features foam padded handles for maximal comfort and stability when you roll. The ResultSport® Double Abdominal Exercise Roller Wheel is a great tool for a solid core workout and will help you to achieve incredible results quickly. It is great for toning and building muscle and strength in the shoulders, arms, back and abdominal muscles including the rectus abdominis and outer oblique’s, aka the ‘six pack muscles’! It even works the lower ab muscles, renowned for their difficulty to target. When you first start using the ab roller it is best to start on your knees. Holding one handle in each hand, slowly roll the ab roller forwards with your arms straight until your body is stretched out horizontally. Don’t worry if you can’t go all the way, it will be tough to begin with! After holding the position, reverse the manoeuvre and repeat. When you exercise with an ab wheel you have to support your whole body weight while you roll. This causes more muscles to contract than traditional abdominal exercises, including stabiliser muscles in the gluteals, quadriceps, muscles of the lower back and core. These muscles are really important for your posture and they help you in all physical activities. Strengthening these muscles will reduce your risk of lower back pain and future injury and will improve your sport performance. This ResultSport® product is backed by our 60 days 100% Money Back Guarantee if you are not completely satisfied. Also it is covered by our LIFETIME product replacement policy, if product EVER breaks under normally usage condition, we will replacement it for FREE!!! A totally risk free purchase for you. This entry was posted in Fitness Products and tagged Abdominal, Double, Exercise, Knee, ResultSport®, Roller, Wheel by Summer 365. Bookmark the permalink.